Halpin, Marjorie M.. "Northwest Coast Indigenous Art". The Canadian Encyclopedia, 26 March 2019, Historica Canada. https://www.thecanadianencyclopedia.ca/en/article/northwest-coast-aboriginal-art. Accessed 20 April 2019. More than 3,000 years ago, Indigenous peoples of the coast of British Columbia (and adjacent areas of Washington State and southeastern Alaska) such as the Haida and Kwakwaka'wakw developed artistic traditions that are heralded throughout the world for their imaginative and stylistic qualities. 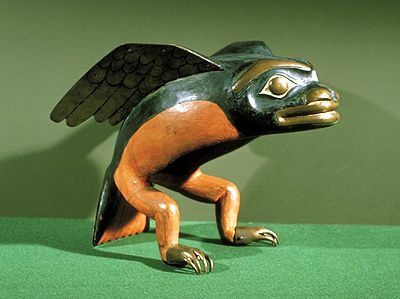 Flying Frog Headpiece, wood, Tsimshian carving, mid-19th century (courtesy NMC). A transformation mask expresses the theme of metamorphosis between beings of the land, sea and sky. 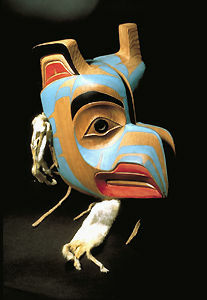 Mask of cedar and ermine tails by Ken Mowat (courtesy DINA). Transformation mask by Ken Mowat shown closed (courtesy DINA). Haida artist Bill Reid is credited with the revival of Northwest Coast Indigenous arts. More than 3,000 years ago, Indigenous peoples of the coast of British Columbia (and adjacent areas of Washington State and southeastern Alaska) such as the Haida and Kwakiutl developed artistic traditions that are heralded throughout the world for their imaginative and stylistic qualities. Apart from their sophisticated design and refined craftsmanship, the masks and totem poles familiar from Northwest Coast Aboriginal art powerfully impacted the work of major American abstract artists such as Barnett Newman, gave rise to a revival of craftsmanship on the Northwest Coast over the past thirty years, and shaped the work of contemporary Aboriginal artists such as Brian Jungen who have largely worked within the mainstream western art world. Objects made in these traditions are so highly formalized and distinctive that once some of the basic principles have been grasped, they can be easily identified. The "formline" is the primary design element on which Northwest Coast art depends, and by the turn of the 20th century, its use spread to the southern regions as well. It is the positive delineating force of the painting, relief and engraving. Formlines are continuous, flowing, curvilinear lines that turn, swell and diminish in a prescribed manner. They are used for figure outlines, internal design elements and in abstract compositions. Throughout the region, special objects were and are still made for the purpose of displaying the inherited privileges and rights of their owners. Although ways of reckoning kinship vary between groups, people claiming common descent also claim rights to ancestrally derived territories, spirit powers, names, songs, dances, crests and other "properties" that both contain and display their family's wealth and identity. Potlatches are events of great pomp and formality arranged to celebrate the handing down of names, rights and privileges from one generation to the next. These privileges, together with the associated artifacts, are publicly displayed and their transfer committed to the collective memory of the potlatching community. Another defining feature of the Potlatch is the distribution of valuable objects, such as food, crests, and, more recently, money by the host group to the guests, who include people from other villages and tribes. Acceptance of gifts constitutes validation by the guests that the host group is transferring its inheritance in the approved manner. Crests, or heraldic art, are objects associated with the potlatch. A crest itself is a concept, usually but not always referring to animals (both natural and imaginary, e.g., thunderbirds), which is given a conventionalized representation. Details of the crest images vary widely, according to personal and stylistic preferences. Not all animal representations in Northwest Coast art are crests. Common crest-bearing artifacts are totem poles, painted house fronts and screens (room dividers), ceremonial robes and headdresses, staffs, feast dishes, spoons and ladles. Crests are jealously guarded possessions — they are a legacy from the ancestors, acquired in mythic time from supernatural animals or images of supernatural beings and to be held in perpetuity by their descendants. To display a crest of another group is an insult to the integrity and identity of that group. 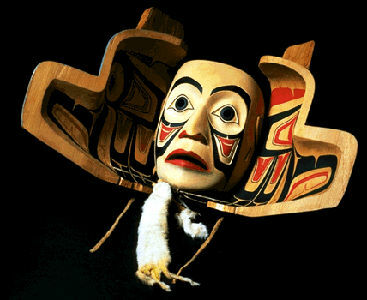 Winter dances, which the Kwakiutl call “cedar bark dances” and which are not exclusively performed in winter, are elaborately staged performances featuring masked dancers and ingenious sleight of hand to create illusions of death and resurrection and other astounding manifestations of supernatural power and presences. In this context, animal representations, most notably masks, are related to but are also conceptually distinct from the potlatch proper. During these rituals, encounters with supernatural powers occur either as spirit possession or theatrical simulation (the distinction is not always clear to observers). Scholars believe that the winter dances developed out of visions of ancient guardian spirits, most highly developed among shamans (mystic healers). The visionary experience was described as the appearance of an animal spirit helper or guardian in a dream or trance. From them, the dreamer drew knowledge and special powers. Northwest Coast shamans used special objects, often made of wood, ivory or bone, in which their spirit helpers were commemorated. These objects include amulets, soul catchers (carved tubular objects believed to be containers for lost souls) and Janus-faced globular shaman's rattles, which are among some of the great masterworks of Northwest Coast art (see Shaman). Northwest Coast societies were unique in that they sustained a group of professional male artists who were largely freed from the general quest for food by the support of wealthy patrons who commissioned works for potlatches and winter dances. It appears that while most men made objects for personal and family use, specialists were responsible for the finely crafted art objects preserved and treasured in museums. Such artists were trained from youth as apprentices by master artists who were often close relatives — uncles or fathers. As well as making the objects, they were responsible for the stagecraft involved in ritual use. While all women wove (basketry and textiles), some women past their child-rearing years specialized as did their male counterparts. In weaving, all of the techniques found elsewhere in North America were used, except true loom (heddle) weaving. The inland Tlingit excelled in false embroidery; the Haida in "self-designed" twined spruce-root hats; the Coast Salish in cherry-bark imbrication on coiled baskets; and the Nuu-cha-nulth (Nootka) or West coast women in twined cedar-bark hats with onion-shaped tops, overlaid with strands of beargrass woven in conventionalized whale-hunting scenes. An exceptional formline weaving technique was developed in the north, becoming a specialty of the Chilkat Tlingit in the 19th century. 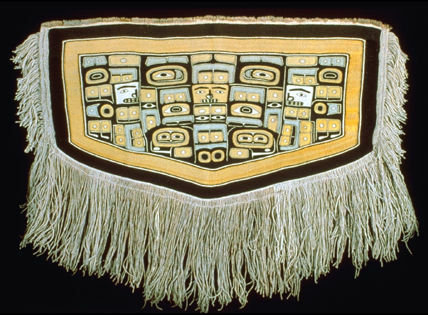 Chilkat blankets are the highest-valued examples of the weaver's art, worn by chiefs as far south as the Southern Kwakwaka'awakw (Kwakiutl). The warps are shredded cedar bark twisted with mountain goats' wool; the wefts are pure wool. The warps were hung from a horizontal bar and the double weft strands were twined across them. Designs were made in formline designs, copied from patterned boards painted by men (see Chilkaw Blanket). The Coast Salish made twill-plaited blankets in geometric designs out of goat wool, cattail fluff and (reportedly) the hair of a small fluffy dog, extinct since early contact times. In the 1980s, women from the Musqueam community near Vancouver revived the art of making twill-plaited blankets. With the introduction of domestic sheep around 1850 and of Scottish knitting techniques, Coast Salish women began producing knitted Cowichan sweaters, which have since become a successful cottage industry. Basket making has also continued with some vitality among the Coast Salish and Nuu-cha-nulth women and is being revived among the Tsimshian and Haida. Woven blankets were replaced by Hudson's Bay Co woolen blankets — both for dancing and as potlatch gifts. Crest designs were sewn on woolen blankets in buttons, shells and appliqué. A series of conventions in Northwest Coast Aboriginal art permits the parts of animals to represent the entire creatures — e.g., a raven's beak, beaver's teeth, whale's flukes. Two animals frequently share a single body, or a single animal is split at the face or along the backbone to create two bilaterally symmetrical profiles; animal parts are rearranged from their biological locations; some are placed inside other animals, or intertwined with them. All these conventions create great formal and iconographic complexities. Most obvious in the winter dances, but also widely recognizable in other Northwest Coast iconography, is the theme of transformation or metamorphosis between beings of the land, sea and sky, and ultimately between the domains of the living and the dead. A special type of transformation mask has double faces operated by strings so that an outer (usually animal) face opens to reveal a human face within. Masks frequently have movable eyes, jaws and other parts. Three major styles of Northwest Coast Aboriginal art have been identified: Northern, Central and Southern, roughly corresponding to broader cultural divisions. The northern province — composed of Tlingit, Haida, Tsimshian, Nisga’a, Gitksan, Haisla and Heiltsuk (Bella Bella) — exhibits a defining style of two-dimensional painting, engraving and shallow relief carving based on a formline aesthetic. Formline compositions in the 19th century were most highly developed on house fronts, screens and chiefs' chests. The works of individual 19th-century masters of the formline aesthetic are being identified according to art historical principles by modern scholars. Formline painting was based on a three-colour scheme of primary black lines (traditionally, charcoal and lignite), secondary red lines (ochres) and tertiary blue-green elements (copper minerals). Pigments were mixed with a medium derived from dried salmon eggs and paint brushes were made of porcupine hairs. Designs were rendered freehand, although templates were frequently used for the recurring ovoid shapes. A northern painting style was highly developed at contact in which painted designs extended to the limits of the field (varying according to the object being decorated). All of the constituent elements in these designs harmonize according to a subtle and sophisticated aesthetic. Sculpted formlines also occur as surface decoration on northern sculpture, including totem poles, headdresses, masks, rattles, canoes, canoe paddles, staffs and various types of bowls, dishes and boxes. Early in the 19th century, Haida carvers began working with soft, black shale (argillite) in order to make curios for sailors and traders, and later for settlers and tourists. By 1880, elements of northern formline painting had been incorporated by the Kwakwaka'awakw and Nuu-chah-nulth people, who adapted them to a prehistoric Old Wakashan style. The Nuu-chah-nulth people developed a new and distinctive combination of formlines, geometric and naturalistic elements. The Kwakwaka'awakw continued to evolve an exuberant and colourful manner all their own. In the early 20th century, they added orange, yellow and green paint to the repertoire. 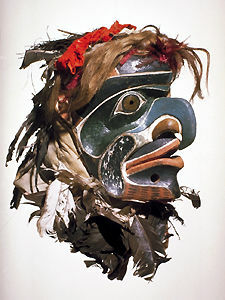 The Nuxalk (Bella Coola) borrowed many stylistic and ceremonial elements from their neighbours, creating a style easily recognized by the heavy and bulbous features of its masks, and the typical use of a medium blue paint. Painting and relief carving in the Coast Salish area is geometric — circles, chevrons, crescents, rows of dots, triangles and T-shapes. Scholars have noticed that these elements revealed a negative (recessed) formline-type design that is considered by some to be an ancestor of the northern formline tradition. Strong, simplified human and animal sculptures — house pots, coffins, grave posts and a single-mask type, the protruding-eye Sxayxway — were also made. After millennia of what appears to be continuous development, Northwest Coast artistic traditions and society were severely disrupted by European contact, beginning in the late 18th century. Although in the first century after contact Northwest Coast Aboriginal art and culture flourished under the stimulus of money, the fur trade, new metal tools and other European technology, the native population was decimated and demoralized by alcoholism and disease, by the imposition of European schools for native children, by the political and religious suppression of the potlatch, and by other forms of colonial oppression. By 1910, the traditional social structure and belief system of Northwest Coast Aboriginal peoples was so fragmented that observers predicted its complete collapse and the inevitable assimilation of a remnant population into Canadian society. Except for a handful of artists, especially in the Central Province, who maintained their skills through traditional apprentice training, the great artistic tradition developed over 3,000 years had degenerated into souvenir production for infrequent tourists. It looked like the end of one of humankind's most distinctive cultural achievements. In 1958, Haida carver Bill Reid (1920–98) and Nimpkish carver Douglas Cranmer began recreating traditional Haida houses and totem poles for the University of British Columbia Museum of Anthropology. 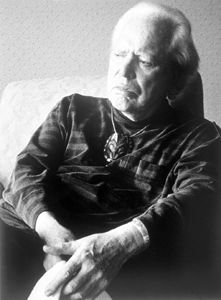 Reid has since been acknowledged as the leader of the Northwest Coast artistic revival. By the 1980s, there were an estimated 200 men (and a growing number of women) seriously engaged in artistic production in all the former styles. A sizable collector's market has developed around their work, and some experts believe that certain new pieces achieve the technical skill of 19th-century masters. Aboriginal artists such as Bill Reid, Robert Davidson, Joe David, Norman Tait, Tony Hunt Sr., Freda Diesing, Susan Point, Dorothy Grant, Douglas Cranmer, and many others are now training a new generation of artists who both sell to the collector's market and make masks, blankets and other traditional objects and regalia, including totem poles, for use by their own people. Since the 1980s, the colour palette has exploded to embrace the full spectrum, and many new materials are utilized, including ceramics, glass and clothing, with objects in the latter category ranging from sweat shirts to haute couture. See also Indigenous People: Art; Pictographs and Petroglyphs. M. Barbeau, Totem Poles (1950) and Haida Carvers in Argillite (1957); F. Boas, Primitive Art (1927, repr 1955); R.L. Carlson, ed, Indian Art Traditions of the Northwest Coast (1983); R. Davidson, Eagle Transforming (1994); .P. Gustafson, Salish Weaving (1980); Marjorie M. Halpin, Totem Poles: An Illustrated Guide (1981); A. Hawthorn, Art of the Kwakiutl Indians (1967); B. Holm, Northwest Coast Indian Art: An Analysis of Form (1965); V. Jensen, Where the People Gather: Carving a Totem Pole (1993); P.L. MacNair, A.L. Hoover and K. Neary, The Legacy: Continuing Traditions of Canadian Northwest (1980); C. Samuel, The Chilkat Dancing Blanket (1982); D. Shadbolt, Bill Reid (1987).